CapEx (short for capital expendituresCapital ExpendituresCapital expenditures refer to funds that are used by a company for the purchase, improvement, or maintenance of long-term assets to improve the efficiency) is the money invested by a company in acquiring, maintaining, or improving fixed assets such as property, buildings, factories, equipment, and technology. CapEx is included in the cash flow statementCash Flow Statement​A Cash Flow Statement (officially called the Statement of Cash Flows) contains information on how much cash a company has generated and used during a given period. It contains 3 sections: cash from operations, cash from investing and cash from financing. section of a company’s three financial statementsThree Financial StatementsThe three financial statements are the income statement, the balance sheet, and the statement of cash flows. These three core statements are intricately linked to each other and this guide will explain how they all fit together. By following the steps below you'll be able to connect the three statements on your own., but it can also be derived from the income statementIncome StatementThe Income Statement (or Statement of Profit and Loss) shows performance from operations of a business. The financial statement begins with revenues and and balance sheetBalance SheetThe balance sheet is one of the three fundamental financial statements. These statements are key to both financial modeling and accounting. The balance sheet displays the company’s total assets, and how these assets are financed, through either debt or equity. Assets = Liabilities + Equity in most cases. This guide will provide a formula for how to calculate CapEx. If you have access to a company’s cash flow statement, then no calculation is necessary and you can simply see the capital expenditures that were made in the investing cash flowCash Flow from Investing ActivitiesCash Flow from Investing Activities is the section of a company's cash flow statement that displays how much money has been used in (or generated from) making investments in a specific time period. Investing activities include purchases of long-term assets, acquisitions of businesses, and investments in marketable securities section. If you don’t have access to the cash flow statement, it’s possible to calculate the net capital expenditure if depreciation is broken out on the income statement (which most, but not all companies do). This formula is derived from the logic that the current period PP&E on the balance sheet is equal to prior period PP&E plus capital expenditures less depreciation. Important Note: This formula will produce a “net” capital expenditure number, meaning if there are any dispositions of PP&E in the period, they will lower the value of CapEx that is calculated with the formula. To adjust for this, you will be required to read the notes to the financial statements. Learn more in CFI’s Financial Analysis Courses. Below is a short video explanation of how to calculate capital expenditures for a company using only the balance sheet and income statement! Now try performing the calculation on your own using a real company’s financial statementsFinancial Statements Examples – Amazon Case StudyFinancial statements are records of a company's financial condition and activities during a period of time. Here are some financial statements examples.. 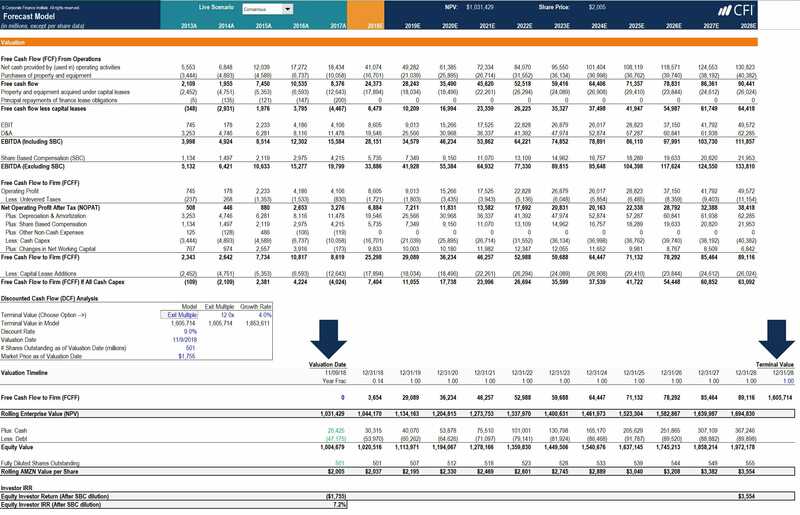 This CapEx formula can be useful in financial modelingWhat is Financial ModelingFinancial modeling is performed in Excel to forecast a company's financial performance. Overview of what is financial modeling, how & why to build a model. A 3 statement model links income statement, balance sheet, and cash flow statement. More advanced types of financial models are built for valuation, plannnig, and, particularly when working with a company that has complicated financial statements and a lot of detail that goes into their capital asset schedules. As the below example shows, a net capital expenditures figure can be build to complete the model until more detailed information is provided. To learn more, launch our CFI’s Advanced Financial Modeling Course, a case study on Amazon. 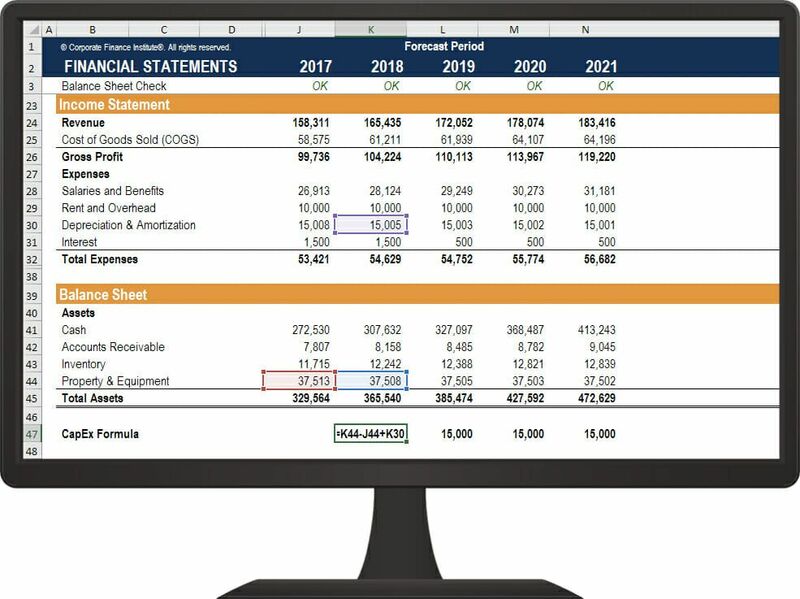 Hopefully, this guide has shed some light on how to calculate capital expenditures yourself using only an income statement and balance sheet. CFI is the official global provider of the Financial Modeling and Valuation Analyst (FMVA)® designationFMVA™ CertificationThe Financial Modeling & Valueation Analyst (FMVA)™ accreditation is a global standard for financial analysts that covers finance, accounting, financial modeling, valuation, budgeting, forecasting, presentations, and strategy. .